VAT is charged at 15% for all EU customers.To get an approximate conversion of this price to your currency, Click Here. GPS Navigation With Your Laptop! The BU-353 USB GPS Receiver has improved accuracy by utilizing WAAS GPS positioning when connected to your laptop's USB port. Travel positions are updated in real-time on your laptop or tablet PC with use of your own street mapping software. BU-353 is totally NMEA-compliant and has the powerful SiRF III low-power chipset meaning less power to operate than other USB GPS's. Quick cold-start times of only 42 seconds while enhanced technology also provides improved tracking in weak signal areas. The BU-353 is a 20-channel USB GPS receiver which includes a built-in LED that indicates satellite acquisition status: Flashing RED indicates searching for satellites, while solid RED indicates satellites are in view and data is being received. 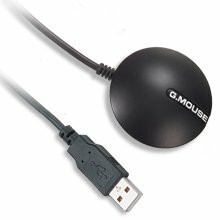 The BU-353 USB GPS Receiver is designed to plug into most any laptop PC's USB port without the need of an additional source for power! Forget dealing with extra batteries, keyboard pass-through cables or 12VDC cigarette lighter adapters, because power and data are both transmitted through a single cable connected to the USB port! The 60" cable with a suction cup clip and the water-resistant housing with a built-in magnet allows flexibility for in-vehicle or external placement. Build-in SuperCap to reserve system data for rapid satellite acquisition. Use your BU-353 USB GPS on business or pleasure and eliminate the frustration of driving in unknown areas, whether it be across town or across the country. With the BU-353 USB GPS and your personal mapping software (not included) installed on your laptop, you can chart your travel progress in real-time. Need to take a detour? No problem, see your exact position in relation to your planned route to easily get back on track by using GPS technology. BU-353 USB GPS requires NO SUBSCRIPTION fees! SiRF binary >> position, velocity, altitude, status and control, NMEA0183 V2.2 protocol, and supports command: GGA, GSA, GSV, RMC (VTG and GLL are optional). 515 meters/sec. (1,000 knots) max. Secure Email with OpenPGP Support Email encryption for Corporations Need a Telnet Server for Windows?